The resuscitation of the classic western genre seems to occur whenever it's fused with another genre, producing dissonant hybrids, intriguing for their anachronistic elements. These hybrids seem to negate the threat mumbled through clenched teeth that, "There's just not room enough for both of us in this here town." Whereas with Cowboys & Aliens Jon Favreau has pursued the "science fiction western"—following on the outlaw trail of such steampunk narratives as Wild Wild West (1999), Back to the Future III (1990) and the ridiculous but oddly entertaining The Valley of Gwangi (1969)—the category of the "weird west" is even richer in representation, ranging from Billy the Kid vs. Dracula and Jesse James Meets Frankenstein's Daughter (both released in 1966), through Ravenous (1999), The Burrowers (2009), right on up to this summer's blockbuster release of Scott Stewart's Priest (2011), based on the manhwa by Hyung Min-woo. Consciously tipping its dusty hat in homage to John Ford's The Searchers (1956)—where the vampires become the Comanche and Paul Bettany steps in for John Wayne—Priest is a post-apocalyptic action thriller set in an alternate world, one ravaged by centuries of war between man and vampires. The war has been won by warrior priests trained in specialized combat; but, once their mission is accomplished, the Church decommissions them into thankless obsolescence and exerts a tight grip on the populace by confining them behind walled-in dystopian cities where cathedral smokestacks belch black ash over the inhabitants. When his niece is abducted by vampires, Priest (Bettany) breaks his sacred vows to venture into the wastelands after them, joined by his niece's boyfriend (Cam Gigandet). Stewart was joined at the WonderCon panel by actors Paul Bettany, Cam Gigandet, Lily Collins, and graphic novelist Hyung Min-woo, who flew in from Korea specifically for the event. 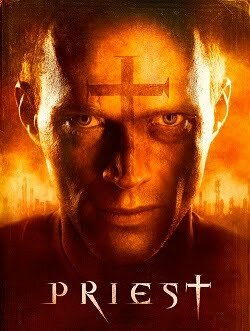 In his entry earlier this year posting the film's "surprisingly solid" trailer, Twitch teammate Todd Brown argued: "Despite being enormously talented Paul Bettany has been on a downward slide lately, some dodgy decisions pretty much killing him as a viable box office star." Judging from Bettany's screaming coterie of female fans (some sitting right next to me) at WonderCon, however, I wouldn't write him off so fast. 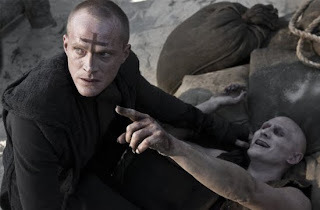 With lethal equanimity, Bettany creates a focused and precise executioner in his portrayal of Priest. Todd's subsequent reassessment that the trailer suggests a film that is "big and burly and stupid in all the right, escapist ways" that "could actually be a lot of fun" might end up proving spot on. I offer a recording of the WonderCon panel Q&A. Honestly? I don't care what this Todd character or anyone else thinks about Paul. No offense meant. 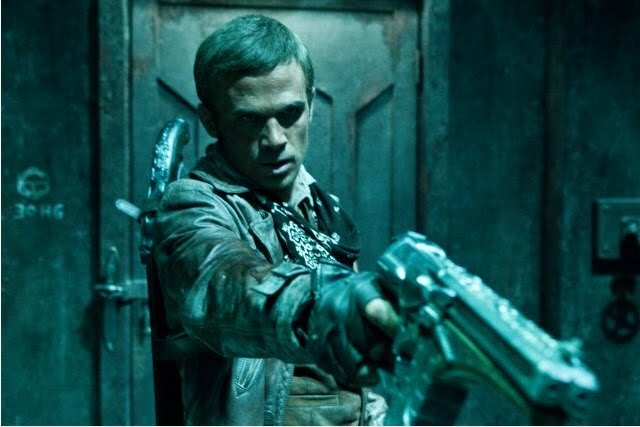 I just love him and his excellent acting ability. He brings so much to the screen, and is an all around funny/nice/charming/caring guy. So that adds more points in the "Katie <3 you category". Looks amazing to me, can't wait to see it. Thanks, Katie, and thanks for stopping by to comment. Your enthusiasm for Bettany was genuinely fun to witness; every star should have a loyal fan like you to counter critical ennui. I will put my dukes up any day to support Paul. Is it time for WonderCon 2012 yet?! Was such a fun experience.